A brand new WhereArtI? quiz for you all today, simply tell me where I am sketching from. First three correct answers will get points on the leaderboard. How well do you know Edinburgh? And please remember to RT and forward this on. 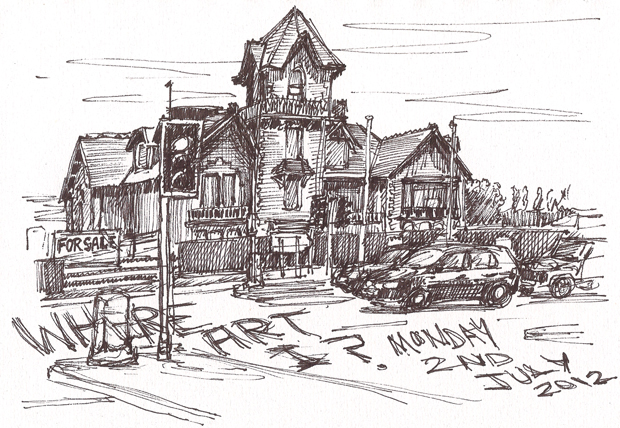 Well done Loraine, and all those who gave the correct answer to this weeks #wherearti quiz – the old Barnton Hotel out at the Maybury junction. I can’t remember the building not being boarded up, it’s such a shame as it is a beautiful building. Situated at the junction to either the west and Glasgow, or towards the Forth Bridge and Fife the building will hopefully be saved and reopened soon. There’s no change on the WhereArtI leaderboard this week as the first three people to post the correct answer were new to the quiz. It’s great to have some new folk entering and giving the regulars some competition!! Welcome to @tycoonmax (3pts), @marksteyn (2pts) and @wornoutmumhack (1pt) and keep entering to climb the top 10. Old barnton hotel…. A real sad sight now!